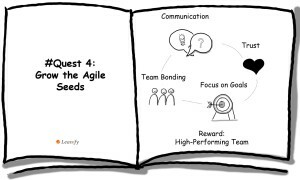 What do coaching and agile have in common? 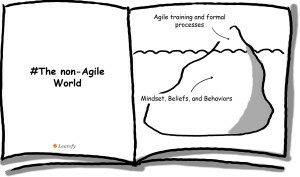 | Leanify Ltd.
You are here: Leanify Ltd. > Blog > Agile > What Do Coaching and Agile Have in Common? I named my talk “The adventures of an agile practitioner in the non-agile world” primarily to underline the fact that I was sharing my own experiences as a manager of a team that was undergoing Agile transformation at the time I joined them. The main focus of my talk was however on how a coaching approach has been helpful, and why I generally think it is a good idea in an agile (or even agile-to-be) environment. I want to discuss mostly this point here. In my story, I (as the protagonist) was faced with the quest to support the transformation of an organization from a more or less traditional “command and control” environment into an agile self-organizing team. The transformation had already started with the necessary training, process, and role setup, but below the surface there was still a huge part of the iceberg with mindset and behaviors to address. It was a challenging task, as it involved influencing individuals that did not know me and trust me yet and guiding them through their existing beliefs into a new environment of more opportunities but also more responsibility, transparency, and self-imposed discipline. Coaching is about asking questions that provoke awareness, hence – development and growth. It focuses on values, therefore, triggers self-motivation, as people learn what is important for them and how their work fits. It is result-oriented and guides people towards formulating ambitious, yet realistic goals and finding ways to achieve them. The coaching process builds on the understanding that people have the needed resources to achieve what they define as important and that they have the answers to their challenges but need some support to find and evaluate them. The coach is not necessarily an expert in the examined domain, but is a skillful guide in the process of inviting client to take responsibility of his life by identifying the desired outcome, creating space for the person being coached to discover and explore the options, summon all of the available resources, and eventually take action. As you can imagine, all of this is a natural fit into the world of Agile, where team empowerment is a cornerstone concept, and it expects responsibility and decision making by the team and the individuals in it. 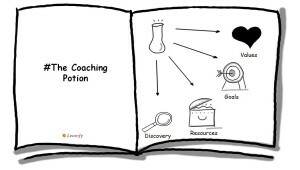 Coaching is a tool to guide them through the decision-making process, allowing space for exploration and learning. Therefore, agile paradigms fit naturally with the coaching approach, making it a very good tool for driving team’s and individuals’ growth and development. Improved communication: people learn how to ask good questions and have meaningful and constructive discussions. Trust: team members learn to respect the values of others, and trust their good intentions and professionalism, thereby raising the overall level of trust in the team. Focus on goals: coaching teaches focus on the outcome, and this is what we need most of the time in agile too. We want to achieve a certain goal as a team, and we don’t want to focus on blaming, punishment and revenge. We only want to look back and learn from what happened, so that next time we are even better in reaching the desired outcome. Team bonding: eventually, all of this creates a glue that keeps the team together and helps them improve further, and leverage their empowerment to reach high-performing state. What I learned out of my experience is that achieving all of this requires time and consistent application of a coaching approach. It requires me as a leader to accept some failure on the way, to apply a coaching approach to myself too, and be open to learn and improve as I go to create the right potion that works well with my team. P.S. Thank you for reading the post. I appreciate your interest, therefore, I would like to share with you a list of coaching questions that you might find useful in your context. Click here to download. P.P.S. If you liked what you read so far, scroll a bit down the page and subscribe for our updates. We promise to use your contacts wisely and send relevant information only.